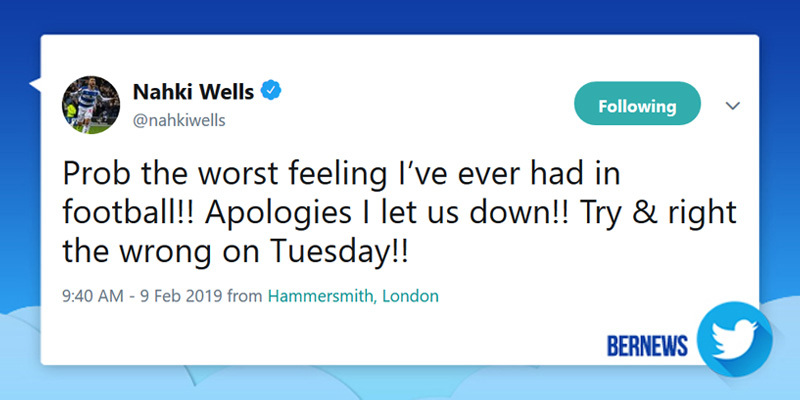 Bermuda’s Nahki Wells has received an outpouring of support from football fans after taking to Twitter to apologise after his penalty was saved in QPR’s recent match against Birmingham. The Bermudian footballer has received positive feedback for the tweet, which has over 1,300 ‘likes,’ and over 400 responses, the vast majority of which appear to be supportive. “You’re a class act Nahki! No need to apologise fella, dust yourself off & keep putting in the effort. You’re a joy to watch,” said another response. “Chin up mate, you haven’t let us down since you arrived and still haven’t!! Sign for us in the summer and all will be forgiven,” said another response. While the vast majority of responses to his tweet appear to be from QPR fans in England, some of the responses are from Bermudians, tweeting to let the footballer know the island remains proud of all his efforts. Many of the best have missed. Your doing your team and Bermuda well, keep your head up. Saw Jamie Vardy miss one today, but it happens to the best. Now thats History, learn from it and keep doing what ya doing. Keep spreading de Oinon Juice. Happens to the best of them. Keep up the good work. No worries. Just dnt let it happen again. Lol. No. Bermuda still loves u. One of the Toughest Tenn Yards to walk !! “Experience teaches wisdom for the next encounter” KsF.